After falling short to a strong defensive performance by Real Madrid on Saturday, Barcelona hosted the best defence in the world in Simeone’s Atlético Madrid in last night’s Champions League first leg. Simeone’s side began the game in their usual 4-4-2-0 shape which showed good structural flexibility to restrict Barcelona’s possession game. They displayed their usually excellent control out of possession as they covered the centre exceptionally well with high levels of compactness and strong staggering between the players. Atléti’s shift to a 4-3-3 for access in the half-space and wing spaces. The wide midfielders held important roles in providing key support in the press of Barcelona’s build-up. When the ball was in Barça’s first line, the ball-near winger would often push up onto the same line as the two forwards whilst the ball-far winger tucked in. This gave the away side a better ability to press in these situations with improved access through a more ball-oriented shape. The ball-near winger’s movement up field allowed him to take on a position where he could quickly press the Barça full-back in case he received a ball. With support from the excellently-connected defensive structure, he could then lead the press to then force Barcelona against the touchline and try and force turnovers. On the opposite side the ball-far winger’s inside movements allowed him to have a man-oriented coverage of the ball-far 8 and give positional support to the double-8 pairing. 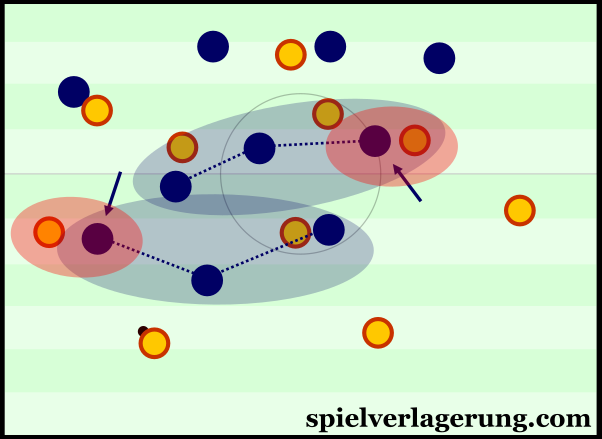 By occupying the ball-far 8, the winger allowed his teammates to shift diagonally towards the ball and take on a more ball-oriented position. Through this mechanism, Atlético’s compactness around the ball was improved and Simeone’s team had a better capacity to form an effective press. Similarly to the last time these two clubs faced each other, Atléti started the game in an aggressive manner as they looked to press Barcelona deep into their own third. At times they even pressed to ter Stegen as they tried to disrupt Barça’s development of the possession and stop them from making a clean first progression of the ball. Atlético’s press was again largely man-oriented as they moved out of position to apply pressure to the passing options during Barça’s build-up. Whilst they defend deeper spaces in a position-oriented block, this scheme isn’t suitable for pressuring the ball as it is oriented around controlling the space and maintaining a strong shape in front of the ball. In order to apply pressure effectively in Barça’s build-up, Atlético first needed defensive access – something that is very difficult to achieve in a position-oriented defensive structure. Therefore, Simeone’s side became distinctly man-oriented in order to find this access to pressure the ball. The players moved up field and adopted positions from which they could cover the relevant Barcelona players and were able to establish access through this. With the ability to effectively apply pressure on the ball, Atleti could then move up and do exactly that. They used these man-orientations to have strong coverage of any nearby passing options and would look to isolate the ball-carrier to try and win the ball in advanced positions. Crucial to effectively pressing what is arguable the best team in the world is to have a strong coverage of the best 6 in the world, Sergio Busquets. This responsibility was co-ordinated well by Griezmann and Torres who worked well together to stop the defensive midfielder from having his usual influence on Barcelona’s possession game. They often had coverage of him through simple man-orientations and would make effective switches in reaction to Barcelona’s ball circulation to maintain this cover. When the ball was around the half-space or flank, the ball-near forward would press the ball-carrier diagonally, using his cover shadow to block passes into the centre and stop the connection between Busquets and the ball. Whilst he is making this press, the ball-far striker would then drop in slightly and have a more direct coverage of the 6 through a situational man-marking role. Although the ball-near striker didn’t have the support of his teammate due to his focus on Busquets, he was supported well by the ball-near winger through the above-mentioned mechanisms in the midfield which created a 4-3-3 shape. Against one of the best pressing systems in the world, Lucho had to find a way to beat the pressure of Atlético and he looked to do this through the wider areas. 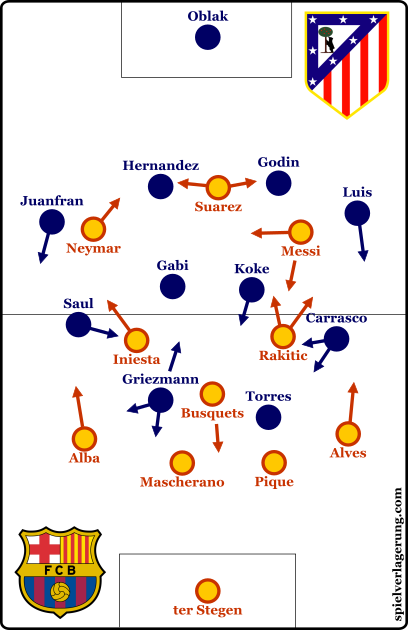 After the opening stages of the game, Iniesta and Rakitic began to move into wider positions and the Barcelona structure became more wing-focused. With better spacing for wide play, the home side looked to beat Atlético’s press by playing through the wing spaces as playing through the centre was near impossible. They were more able to develop strong connections in spaces close to the touchline and through the support of Iniesta and Rakitic as well as the deeper positioned full-backs, Barcelona were more able to progress through the wings. However it didn’t take long for Simeone’s team to react to this change and they quickly moved towards a 4-5-1 shape around the 15th minute. This mid-game adaption is a common feature of Atlético’s game and is something they did when the two sides played each other at the start of February. Torres became the only striker and Griezmann moved to the right side of the midfield whilst Saul came inside as an additional central midfielder. With this extra player in the midfield line, Atléti were better equipped to defend against these wider areas and could disrupt Barça’s wide developments to some extent. The coverage of Busquets was maintained by Torres who now individually blocked passes into him whilst the wingers situationally supported the press by advancing up through the half-space, often for access to the full-back. There also seems to be some fitness component to this shift, as it is obviously very difficult to maintain pressure on Barcelona for long periods at a time. As they changed to a 4-5-1, the pressure on the opposition was reduced and Atlético were more content to control the space as they do so well. I’m fairly confident however, that the main reason for this shift was to counter the adaptions of Barcelona in their attempts to progress the ball cleanly. Before this shift, Barcelona attempted another way in beating the Atleti press by having Busquets drop deep into the defensive line. On a theoretical level, this could allow Barcelona to open the passing lanes through the half-space through a better coverage of the width of the pitch with the 3-chain in the first line. However this shift wasn’t as effective as they had hoped, the spacing between the back three wasn’t strong and they were often too narrow, restricting each other’s space as well as the coverage of the width of the pitch. Although it created some situations where they were in a strong position, these were few and far between and the passing lanes weren’t opened like they would’ve wanted. Furthermore, it reduced Barcelona’s ability to break through the wider areas as mentioned above. Without Busquets in the 2nd line of players, the two 8s now had greater responsibility to provide central presence and therefore their ability to move out and support wider developments was restricted. It was only after Busquets moved higher up that Barcelona could make the aforementioned wide breakthroughs. Although not truly related, Atlético were able to break through a weak defensive structure shortly after this shift and Torres opened the scoring in favour of the away side. However towards the end of the first half, the forward cost his team dearly as he got himself sent off and Atlético were down to 10 men. The away side immediately shifted to a 4-4-1 shape as Carrasco took on the striker position whilst Griezmann stayed on the wing. Being a man down, it was no surprise to see a more reserved effort as the high press was no longer and Atlético attempted to hold onto their 1-0 lead with the possibility of a few counter-attacks to try and get a second goal. In seek of getting back into the match against a now-1o men Atlético, Barcelona progressively attacked more and more with a dominance of the ball against an opposition defending in a deep low block. The deep positioning of Carrasco in the 4-4-1 gave Mascherano the freedom to move higher and leave Pique in a sweeper role and could form a double-pivot pairing with Busquets. This duo helped recycle the possession and theoretically allow a greater presence in the midfield which was typically congested. Messi frequently moved inside and acted largely between Iniesta and Rakitic whilst Neymar came into a central position too as the flanks were occupied by the respective full-backs. In some cases Pique even made quick runs into the box to give Barcelona some potential in crossing opportunities as Atléti’s ultra-compact low-block made it difficult to break through the centre, even against 10 men. In a similar way to the previous meeting, it was an interesting game with numerous tactical developments from both managers throughout the game. Atlético’s 1st half performance was exemplary as they controlled the game without the ball yet the turning point lied in Torres’ dismissal. With 10 men, Atlético were under endless pressure from the hosts and eventually the score was turned around in favour of Lucho’s team. The 2nd leg is now poised to be another excellent clash with a roughly equal chance of both teams progressing in the Champions League. Hey TP, are you going to do a tactical analysis of the second leg at the Calderón? If Aletico can score first during the next meeting, they will make it even harder for Barce to get back into the tie.